Monster Energy Rock Allegiance Festival returns with the first ever live music event at Philadelphia’s PPL Park Saturday, October 10, featuring top rock bands, along with a craft beer and gourmet man food experience celebrating what makes Philadelphia cuisine famous, unique and delicious. Monster Energy Rock Allegiance will include 12 hours of non-stop entertainment with music performances from some of the premier rock bands in the world rotating on three stages. 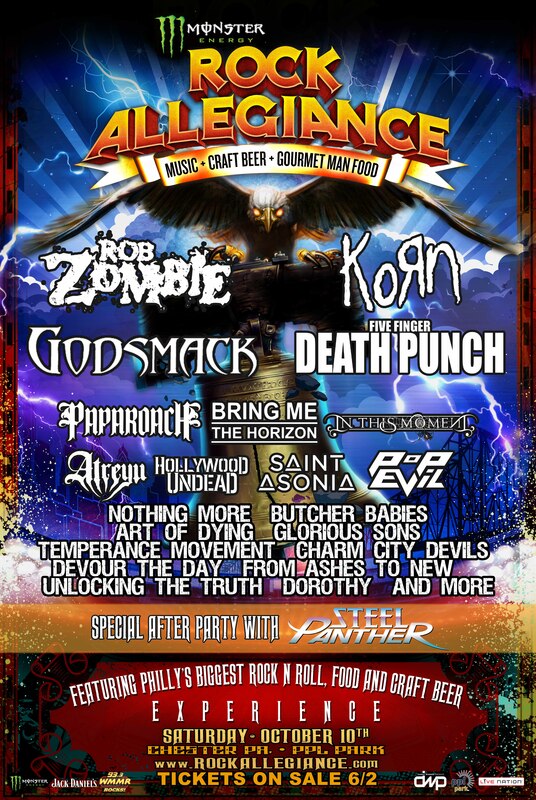 The initial band lineup for Monster Energy Rock Allegiance includes: Rob Zombie, Korn, Godsmack, Five Finger Death Punch, Papa Roach, Bring Me The Horizon, In This Moment, Atreyu, Hollywood Undead, Saint Asonia, Pop Evil, Nothing More, Butcher Babies, Art of Dying, Glorious Sons, The Temperance Movement, Charm City Devils, Devour The Day, From Ashes To New, Unlocking The Truth, Dorothy and more. The official aftershow party will feature a special performance by Steel Panther immediately following Rob Zombie’s closing set at the tent stage on the festival grounds. Check out a video from Steel Panther about their performance HERE. Craft beer partners include Victory, Troegs, Star Hill, Fordham & Dominion, Evolution, and New Belgium, with more to be announced. 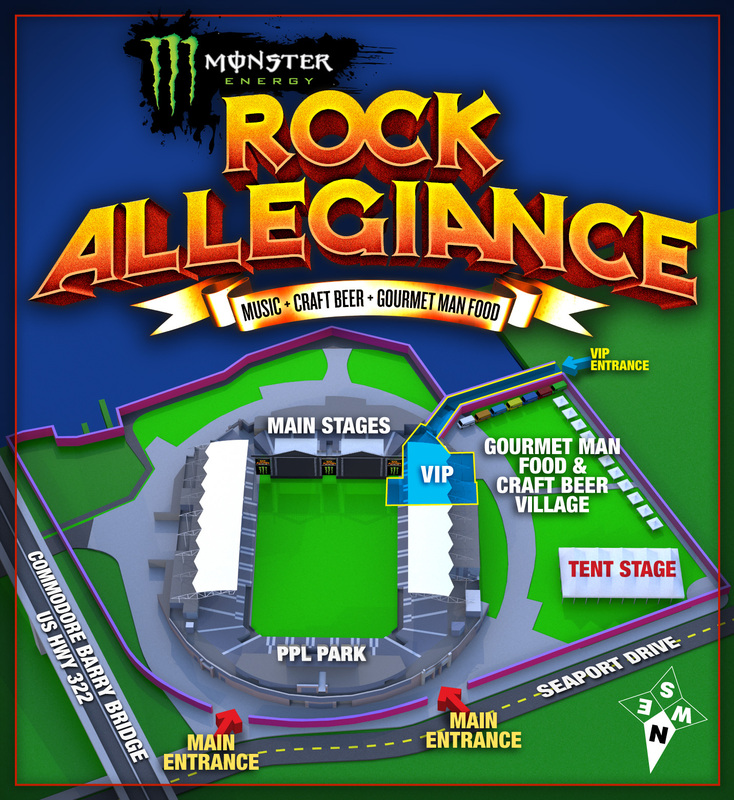 The initial list of food offerings for Monster Energy Rock Allegiance features Braz-BQ, Chickie and Pete’s, The Cow and the Curd, Dos Hermanos, Dump N Roll, Jim’s Steaks, M.A.T.T.’s Food Truck, Mama’s Meatballs, Seoulfull Philly, and Sum Pig, with more to be announced. A special rolling discounted ticket pre-sale for Monster Energy Rock Allegiance will begin on Tuesday, June 2 at 10:00 AM ET and run through Thursday, June 4 at 9:59am ET (or when pre-sale tickets sell out) HERE. VIP Tickets, Hotel Packages and Stadium Ticket 4-Packs go on sale Tuesday, June 2 at 10:00 AM ET. General Admission tickets will go on sale to the public Thursday, June 4 at 10:00 AM ET. General Admission tickets start as low as $44 and will be available online HERE, ComcastTIX.com, by phone at 1-800-298-4200, or in person at the PPL Park box office. Advance parking passes will be available for purchase. VIP tickets are limited and will be available while supplies last. VIP tickets include: a VIP entrance to venue, access to a dedicated section of the Stadium floor; a stadium seat; access to a VIP area featuring dedicated full cash bar, beverage and food vendors, shaded areas, picnic tables and additional restroom facilities; and a VIP commemorative guest laminate that will be picked up at the VIP entrance day of show. 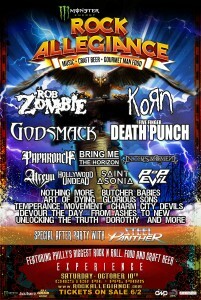 For full details about all tickets, hotel and VIP packages, visit www.RockAllegiance.com. 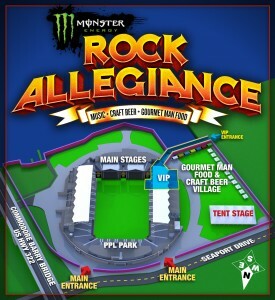 Monster Energy Rock Allegiance is produced by Danny Wimmer Presents, Global Spectrum at PPL Park and Live Nation. DWP is a producer of some of the biggest rock festivals in America, including Rock On The Range, Monster Energy Welcome To Rockville, Monster Energy AFTERSHOCK Festival, Monster Energy Fort Rock, Monster Energy Carolina Rebellion, LOUDER THAN LIFE, Northern Invasion, The Big Ticket, and more. PPL Park is a state-of-the-art Major League Soccer stadium that serves as the home to Philadelphia Union and is located at 1 Stadium Drive in Chester, PA, just outside Philadelphia. “I want to thank Monster Energy for coming on as our title sponsor and for their continued support of rock music. Monster Energy is the perfect partner for DWP events since they share our vision, fully embrace the rock culture, and devote time and money to helping to develop tomorrow’s festival headliners,” comments Danny Wimmer of Danny Wimmer Presents. The festival is fueled by Monster Energy. Additional 2015 sponsors include Jack Daniel’s and Fxck Cancer, with more to be announced. To receive advance notice and special offers to future PPL events, join the free PPL Park CyberClub here.